Despite a system of "open choice," academic screening in high school admissions separates low-performing and high-performing students into different schools, which drives racial and socioeconomic segregation. #1: Establish minimum academic diversity thresholds in the high school matching process. Ensure that at least 25% and no more than 75% of each high school's incoming freshman class has passed middle school state tests. Graduation rates are not sufficient indicators of a school's performance. Include each high school's college readiness rate and other metrics that indicate the level of academic rigor. Verify the accuracy of information about clubs, activities and course offerings. Finally, ensure that all 8th grade students receive high-quality guidance and support throughout the application process. #3: Admit a proportional number of students from each middle school to specialized high schools. Offer seats to the top 7% of students from every middle school, according to a combination of class rank and state test performance. 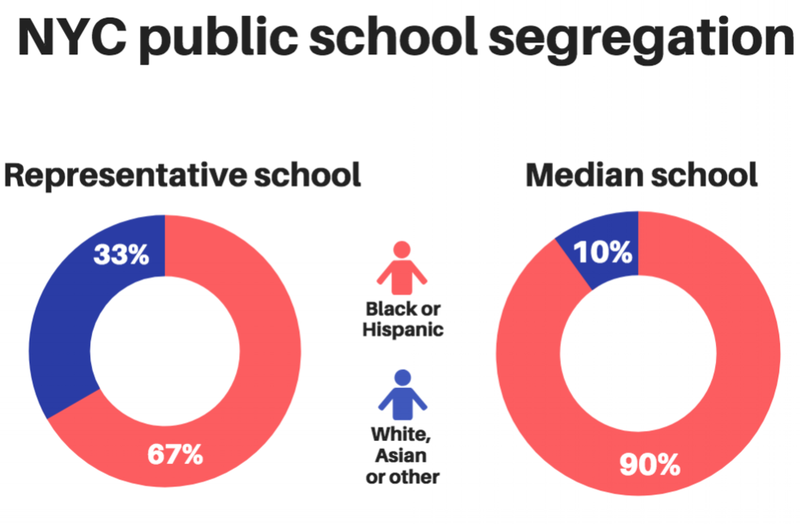 New York City’s public schools are among the most segregated in the nation. While residential segregation poses a significant barrier to school integration at the elementary and middle school levels, high school students are not restricted by neighborhood boundaries. The city's 480+ high schools operate under an "open choice" admissions system that allows students to attend any school in the five boroughs as long as they meet the entrance requirements. Despite this freedom of choice, segregation persists in high schools. By some measures, high schools are more segregated than elementary and middle schools. There are several reasons for this, but academic screening plays a major role. Our plan targets screening at the highest performing schools but also addresses the extreme concentrations of low-performing students on the opposite end of the system. Increasing diversity at a handful of sought after schools is not the purpose of this plan. We want to create equity and integration across the entire system, and we think the following proposals are a good place to start. PROPOSAL #1: Establish minimum academic diversity thresholds in the high school matching process. By Fall 2020, ensure that at least 25% and no greater than 75% of each high school's incoming freshman class passed the 7th grade state English exam, math exam or both. Paid summer internships aligned to the school-based SYEP model. The opportunity to participate in sports or extracurricular programs offered at another public high school, or vouchers to pay for equivalent programs on the private market. At least 60 minutes of one-on-one college and career counseling per month during junior and senior years. She is a junior at School A, a screened school. Screened schools are allowed to create their own admissions criteria, such as interviews, portfolios, and middle school GPA requirements. Many are highly competitive and located in affluent neighborhoods. Coco chose School A over a specialized high school. Only about 1/4 of students at School A qualify for free or reduced-price lunch. Almost every student at School A enters at or above grade level in math and English, according to state exams. He is a senior at School B, an unscreened school. Unscreened schools do not have the ability to select students based on prior grades or test scores. The least competitive unscreened schools are commonly located in poor neighborhoods and receive a very different concentration of students than screened schools. More than 4/5 of students at School B qualify for free or reduced-price lunch. Hardly any students at School B enter at or above grade level in math and English, according to state exams. In essence, the high school admissions process leads to a triple segregation of schools by race, class and academic performance. We understood this anecdotally, but we decided to do a deeper analysis of DOE data to determine exactly how students were being sorted across the system. When we looked at the entering ELA proficiency rate of every high school (the percentage of 9th graders who passed the 8th grade state ELA test), we quickly discovered that School A and School B were not outliers. They are the norm. Citywide, about 40% of students passed the 2016 8th grade English Language Arts (ELA) exam. That means, in an average high school, about 40% of students enter proficient or higher in ELA. 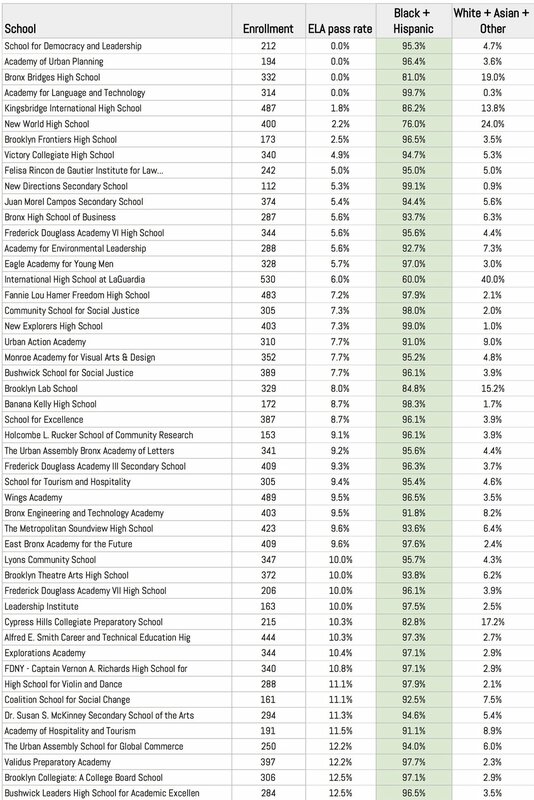 There aren't many "average" high schools in New York City. The proficiency level of entering freshman classes varies tremendously. At some high schools, 0% of freshmen passed the 8th grade state ELA exam. At others more than 95% of students passed. The list below (Fig. A) displays the size and racial breakdown at each of the 24 high schools with an incoming ELA proficiency rate above 70%. FIGURE A: In the 2016-17 school year, 24 high schools admitted a freshman class in which more than 70% of students had passed the 8th grade English Language Arts test. The citywide pass rate on that exam was 40%. Each of these schools screens students based on prior academic performance. Just 3 of the 24 are majority black and Hispanic in a school system that is 68% black and Hispanic. Meanwhile, at more than 140 high schools, fewer than 1 in 5 freshmen passed the 2016 8th grade state ELA exam. Every one of the schools on the list below (Fig. B) is majority black and Hispanic. FIGURE B: Notice that the average enrollment (352) is about half the average size of the 24 screened schools (709) at the other end of the spectrum. The percentage of white & Asian students is, on average, 10 times lower than at the list of 24 screened schools. Schools with such extreme concentrations of low-performing students are forced to devote significant resources to support remediation and are not able to offer a college preparatory curriculum. By reducing the academic screening and setting minimum thresholds for academic diversity, the DOE can ensure that every high school receives a more balanced mix of low-performing and high-performing students. Doing so would help racially and socioeconomically integrate high schools and reduce costly expenditures on "Renewal" schools. There are 31 Renewal high schools. All of them have an entering proficiency rate below 20% in math, ELA or both. But the $500 million investment, which does not address enrollment patterns, has led to disappointing results. Research shows that disrupting high concentrations of economically disadvantaged students is the quickest way to turn around school performance. Because academic outcomes correlate closely to socioeconomic status, we believe that our proposal is an effective, low-cost method for creating more positive outcomes at the lowest performing schools. Publish each school's racial and socioeconomic breakdown, college readiness rate and average SAT score. Verify that each school's description, available courses and extracurricular opportunities are accurate and up-to-date. Based on the data here, which of these Brooklyn schools would you choose? The schools have a similar enrollment (524 vs. 587), a similar graduation rate (76% vs. 80%), a similar attendance rate (91% vs. 87%), a similar percentage of students who feel safe at school (81% vs. 83%). They both offer Spanish and three Advanced Placement courses. What if we told you that the college readiness rate (the percentage of students who graduate prepared for college, according to City University benchmarks) at Victory Collegiate was 6% and the college readiness rate at Rachel Carson was 43%? And that the average SAT score at Rachel Carson was 150 points higher than at Victory Collegiate. Would that help you decide? While affluent families often have the time and resources to do additional research and set up school visits to help their children make the best choices, low-income families often rely solely on the directory. Hear more about Deen's story in this episode of Miseducation, a podcast produced by The Bell with a team of student interns. This was the case for Muhammad Deen, a senior at Victory Collegiate and member of Teens Take Charge, who wishes he had known more about his school's performance before he selected it. He said that "about 70%" of the clubs and activities advertised in the directory no longer existed and that he wasn't able to take a science class as a freshman. It's crucial that the DOE include college readiness rates; average SAT scores; updated information about clubs and activities; and other key indicators of school performance in the high school directory. PROPOSAL 3: Admit a proportional number of students from each middle school to specialized high schools. In January 2018, we began calling for admissions changes to the city’s eight specialized high schools, which are 91% Asian and white in a school system that is about 30% Asian and white. Specifically, we proposed replacing the multiple-choice entrance exam with a more holistic method that draws top students from every middle school in the city. 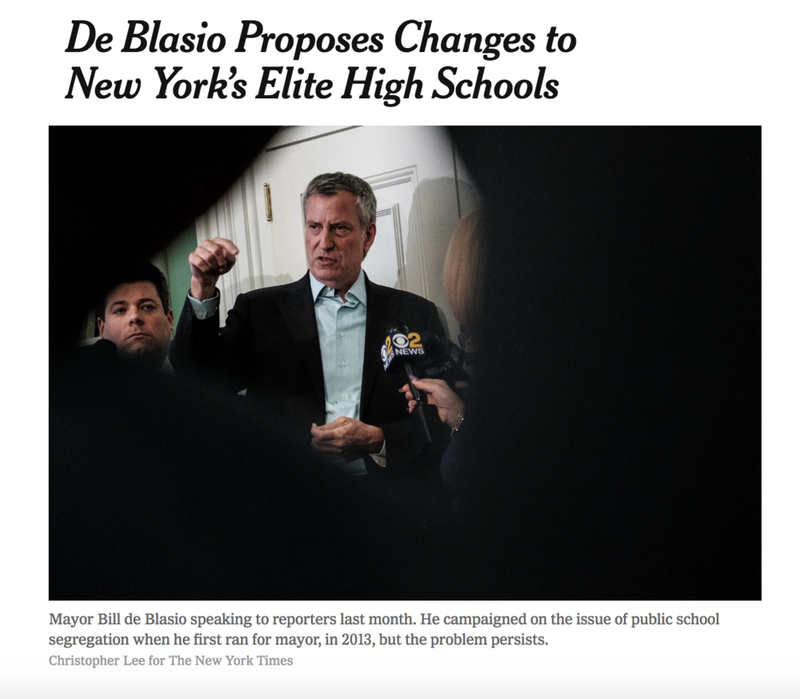 In May 2018, Mayor de Blasio put forth a very similar proposal that would reserve specialized high school seats for the top 7% of students from every middle school (as determined by a combination of GPA and state test scores). The proposal draws on research from the Community Service Society of New York that shows how this proportional allotment approach would meaningfully diversify the schools without sacrificing their high academic bar. The city estimates that the collective black and Hispanic enrollment in specialized high schools would jump from 9% to 45% in three years as the plan is phased in. While we know that many variables affect a school's quality, we can no longer ignore the vital role of student enrollment. If you support our plan, please spread the word and your name below. In addition to reducing the number of struggling schools and increasing socioeconomic and racial diversity, which has known cognitive and social benefits, we believe that creating more academically diverse schools will also lead to significant gains in the city's overall college readiness rate. Data show that 148 high schools in New York City had a college readiness rate below 20% last year. ("College readiness" is a quantitative measure defined by City University that relies on English and math graduation exam scores.) 144 of those schools also had an entering student proficiency rate below 20% in math, ELA or both. In other words, there is a strong correlation between very low entering proficiency and very low outgoing proficiency. The same is true on the upper end of the spectrum. Schools with very high entering proficiency rates also have very high outgoing proficiency rates. But, in the middle of the spectrum, the correlation does not appear to be as strong. A number of schools with below average incoming proficiency rates have above average college readiness rates. We plan to do a deeper analysis, but our hypothesis is that a critical mass of high-performing students in New York City high schools leads to significant gains among low-performing students. We see strong examples of schools across New York City that enroll a balanced mix of academic performers (20-50% entering proficiency) and achieve excellent college readiness rates. In the 2000s, the New York City high school system underwent a major transformation. Mayor Bloomberg and then-schools chancellor Joel Klein, with support from the Gates Foundation, replaced dozens of large, low-performing high schools with small high schools that could better cater to students' needs. Researchers have concluded that the new small schools have helped lift citywide graduation rates but have not significantly impacted college readiness rates. As shown in the data above, more than 100 small schools have college readiness rates below 20%. Small schools also lose out on the economies of scale that allow larger schools to offer a wide-range of extracurricular opportunities, courses and sports teams. Because many small schools are located in the same buildings as other small schools, we would like to explore the impact of combining small schools into medium-sized schools, which would allow the schools to pool resources and offer a wide range of classes and programs that could help attract higher-performing students. We do not want our plan to be seen as an endorsement of state tests, which we believe are inherently flawed and for which schools spend way too much instructional time preparing. Currently, because so many high schools consider test scores in admissions decisions, students are implicitly rewarded or punished based on their 7th grade state exam scores. This has to stop. Our plan would help remove the punishment / reward for state test performance and instead use the data as information to help create more balanced high schools across the board. Over time, we would love to see all schools move away from high-stakes tests and replace them with more holistic evaluation criteria. But, no matter how students are evaluated, we believe the goal should always be to create schools where students of all abilities and backgrounds learn and thrive together. Join us in calling on the Mayor and Department of Education to adopt this Enrollment Equity plan.